After recently watching about 92 per cent of The X-Files, I totally understand the excitement around the return of the series to television. The show that stars David Duchovny as Fox Mulder and Gillian Anderson as Dana Scully has the best parts of a police procedural with the characters’ feet dipped into the paranormal and the occult. The X-Files has so much variety and the dynamic between Spooky Mulder and the utterly-scientific Scully gives the characters a kind of balance you just don’t see in shows today like Bones. The point being, I love the show, but there’s one episode that I really couldn’t stomach: The Host. I’m not going to front by saying that I have a stomach made of steel when it comes to horror movies. I get super grossed out at things involving any kind of realistic violence or gore because, for me, it’s the things other than visuals that get me, especially the superimposed olfactory aspects of the experience. Do you know what burning flesh smells like? I do because of some oral surgery I had when I was a child due to having an impacted canine tooth. It’s what I think about whenever I see someone on fire in a movie and it makes me internally gag just a little bit. It’s like the worst burnt bacon you’ve ever had except there’s no porky smell just a strange human funk. Ugh. Now the episode The Host is about a fluke-like alien thing that’s found in a Russian submarine’s septic system escaping into the United States. When this organism infects someone, it slowly starts to transform their body with the first noticeable change being a weird taste in their mouth. Again, the gag factor starts up for me. When I was a kid, another one of baby canines got infected up the near gum. Now if you’ve ever had a tooth infection, then you know what I’m talking about in terms of The Smell. Yes, I put caps onto that because it has a very specific pungent odor that I can still sometimes smell when I think about that tooth. It was that bad of an experience that I can still remember how it smells to this day. The fact that this kind of pungent odor fills the mouth of the fluke’s victims is just…………. fjdoafodisajfiodsaoifnewquindismacdimacdofdsaodjfsaoijf. Ahem, but that’s only the start. You’ve probably seen this guy on the Internet, but yes this is flukeman. In the episode, Fluke Man, or the worst super hero of all time, escapes capture only to go into hiding inside of a port-a-potty. We see his legs just slip past the bowl and into the murky depths below… yeah. And then it gets sucked up by a septic draining truck and into an evil larger hellscape filled with human waste. Now, I don’t know about you, but there’s nothing worse than the smell of human waste. I wouldn’t really know a real example of this smell as neither the kid nor adult of me has had any close encounters with a room full of the second kind, but I have had some experiences with our family dog when he was a little sick. The poor dog had a bad bout of diarrhea once and one night I could hear him crying from his crate downstairs. I went into the dining room where he sleeps and ran into a wall of chlorine-like fug. I say fug because that’s about the only way to describe the air that hanging inside of the room. I took him out of the crate, picked up him, put on his leash, tied him up in our backyard, and cleaned up him a little. I also took out his bedding and threw them onto a bush outside just so the smell wouldn’t get any worse inside. Now imagine that kind of experience multiplied by a thousand times and that’s what I imagine you get in the septic system that Fluke Man willingly launches himself into. It’s a damn good thing that the parasite has seemingly removes a human’s nose. Screw flukeman, what the heck happened to squirrel girl??? According to the VHS release of A Private Conversation with Chris Carter: The Creator of The X-Files, the episode was actually inspired by a bout of worms that his dog had and the events surrounding the Chernobyl nuclear disaster. One thing that I can appreciate about Fluke Man is that it took the actor who was put into the suit about six hours to get the whole ensemble on. It’s also noted that Darin Morgan, who would later become a writer for the series, had to wear the suit for a total of 20 hours, he couldn’t breathe through his nose, he had to use the washroom with it on, and the damn thing dissolved in water meaning it had to rebuilt after each day of shooting. 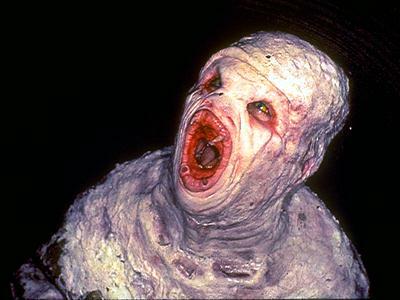 Anyway, this was probably the only episode of The X-Files that had a gross factor far outside my tolerance levels, so Carter and his crew totally succeeded in what they were trying to create with Fluke Man. The thought of some parasite entering into your body and making you desire to be surrounded by horrible fluids makes me feel even sicker than I was when I first started writing this article. After drinking a gallon of ginger ale and eating some saltine crackers, I’m good and still excited for the new seasons of The X-Files. Watching the show finally made me understand why some people see the show as a worthy successor to Twin Peaks. It has depth and it’s also kept pretty episodic, which I like better than shows with overarching plots. I can’t tell you how much I hate THE DUANE BARRY and how his saga ended up being so important to the series. And just so long as Fluke Man doesn’t make a guest appearance in the new show, you can count me in on every episode. This entry was posted in Science Fiction & Fantasy, Television and tagged Dana Scully, Fox Mulder, The X-Files. Bookmark the permalink.